Summer of Salads continues this week in fruity fashion with Tropical Fruit Salad with Vanilla Bean. Cute, sweet, and great for parties! Kiwi fruit is ridiculously appealing. Have you noticed that? They are palm-sized and fuzzy, with a bright green medallion pattern in the center. Plus they are sweet, tangy, and totally irresistible. I think that’s why kids love them so much. Every time I bring home a bag of kiwi from the grocery store, they disappear from the fruit bowl faster than anything else. 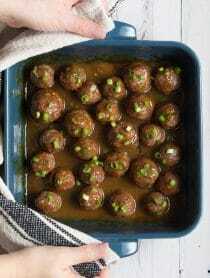 My kids will cut them in half and scoop out the tender flesh with a spoon, leaving fuzzy little brown cups laying on the counter. It made me wonder why these cups couldn’t be used as a vessel to serve a festive summer treats like my summer fruity mix, Tropical Fruit Salad with Vanilla Bean. I absolutely love this petite fruit salad with fresh diced kiwi, pineapple, mango and strawberry. Those four fruits are fabulous tossed together as-is. However, today I’ve amped up the flavor of this fruit salad by adding fresh chopped mint and the seeds of one fresh Tahitian vanilla bean. The combination of the cool mint flavor and the bold vanilla essence, with the tropical fruits, is soooo inviting. 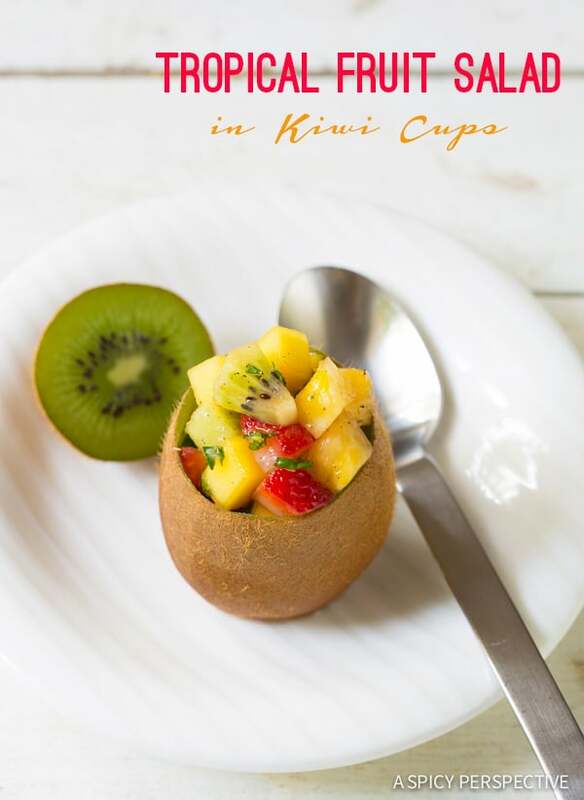 You can serve this Tropical Fruit Salad with Vanilla Bean in small ramekins or hollow out additional kiwi for festive edible cups! 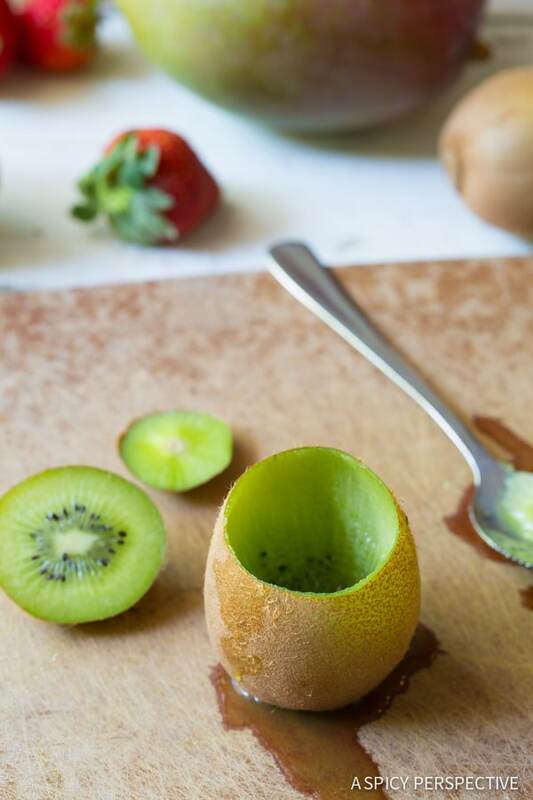 Turning kiwi into edible cups is easy to do. 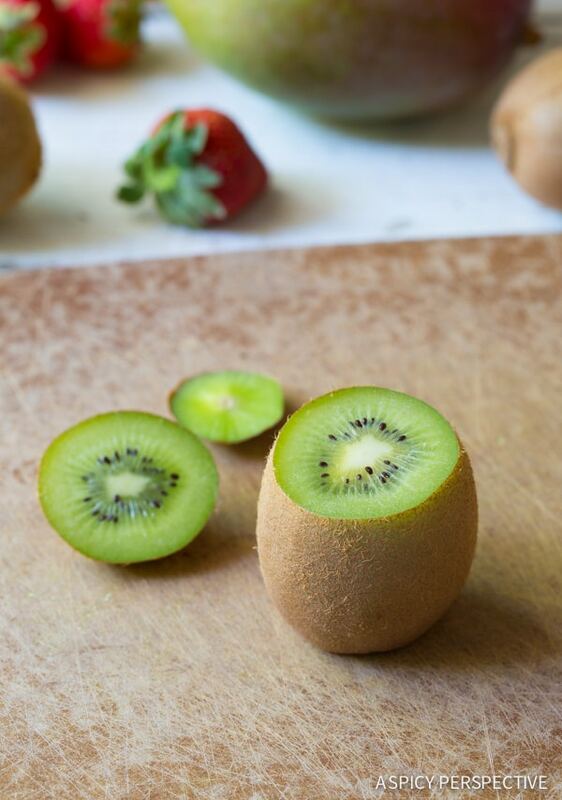 Simply shave the bottom flat so each kiwi can stand on end. Then slice off the top to open up each kiwi. You can use the tops as little lids or discard. Then using a spoon, carefully scoop out the flesh leaving a deep well in the center of each kiwi. Make sure not to scoop all the way to the bottom; you need a base for the Tropical Fruit Salad with Vanilla Bean to sit on. 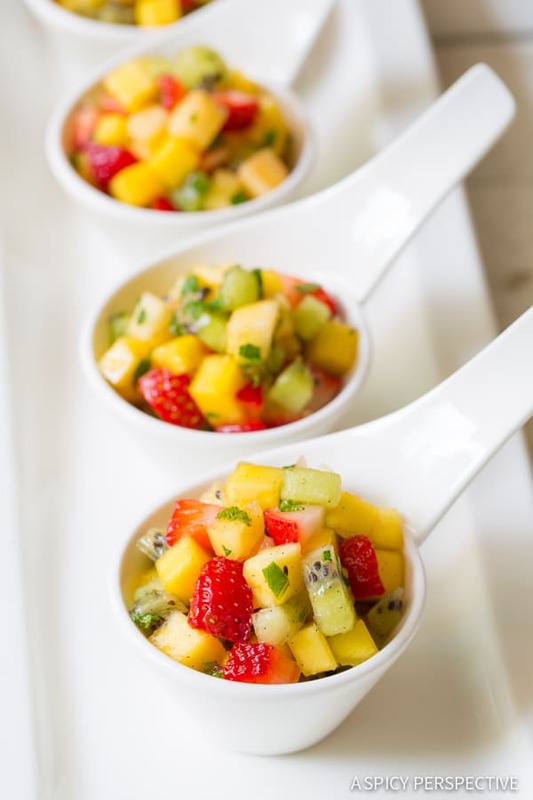 Tropical Fruit Salad with Vanilla Bean in Kiwi Cups are fun to serve at summer parties and picnic. Fill them ahead and place on a baking sheet in the fridge until it’s time to party! 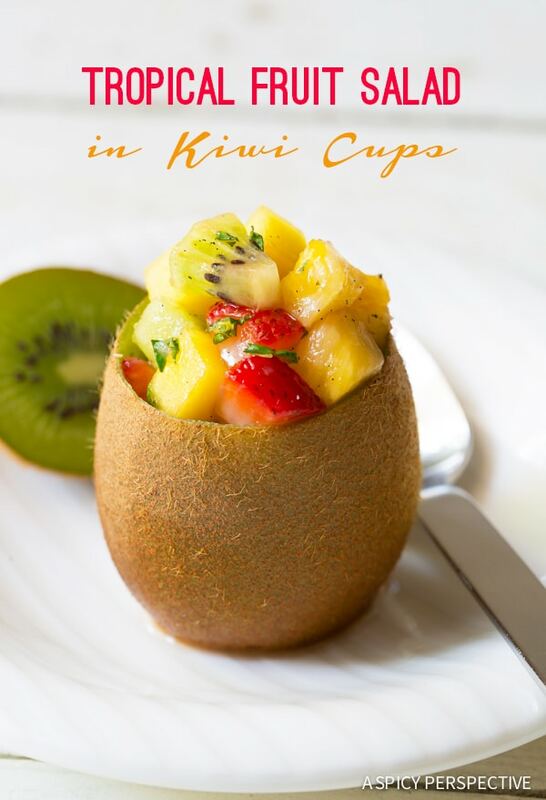 Tropical Fruit Salad with Vanilla Bean served in fresh Kiwi Cups! 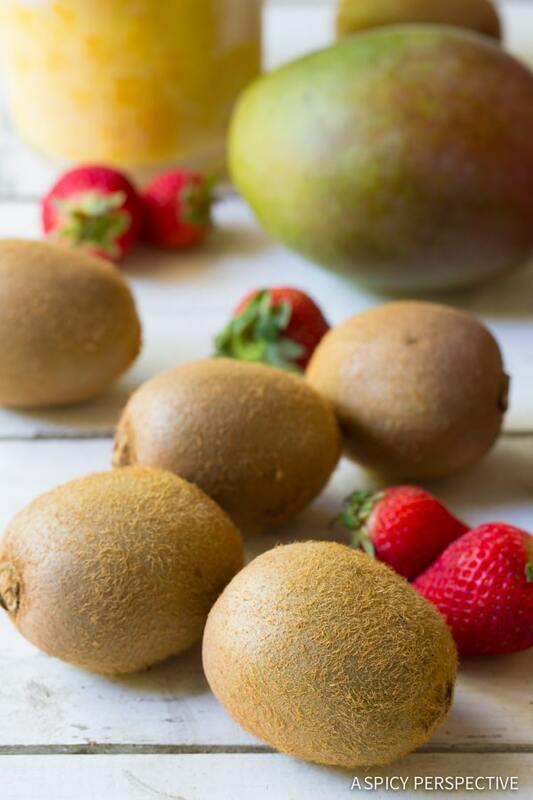 This simple fruit salad recipe is loaded with kiwi, mango, pineapple and strawberries. If making the kiwi cups, shave the bottom of the kiwis off so they can stand on end. Then slice ¼ inch off the top of each. 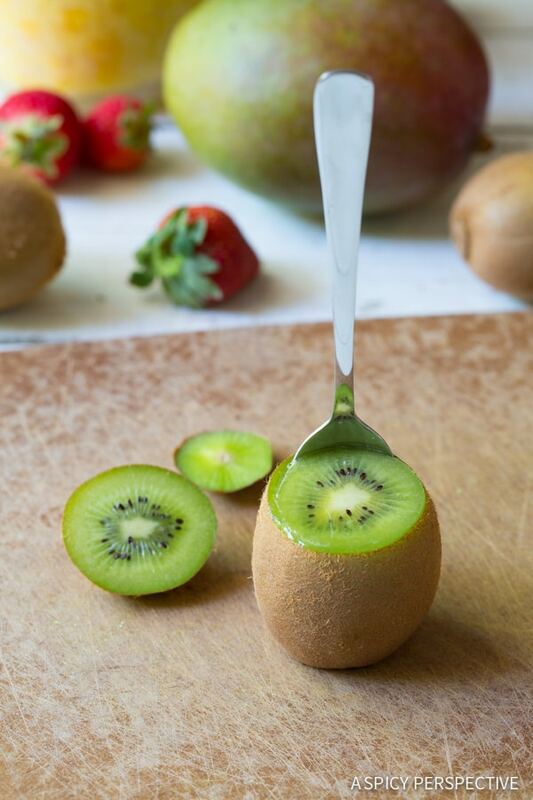 Use a spoon to cut the flesh out of the kiwi in a circular motion. Save for the fruit salad. 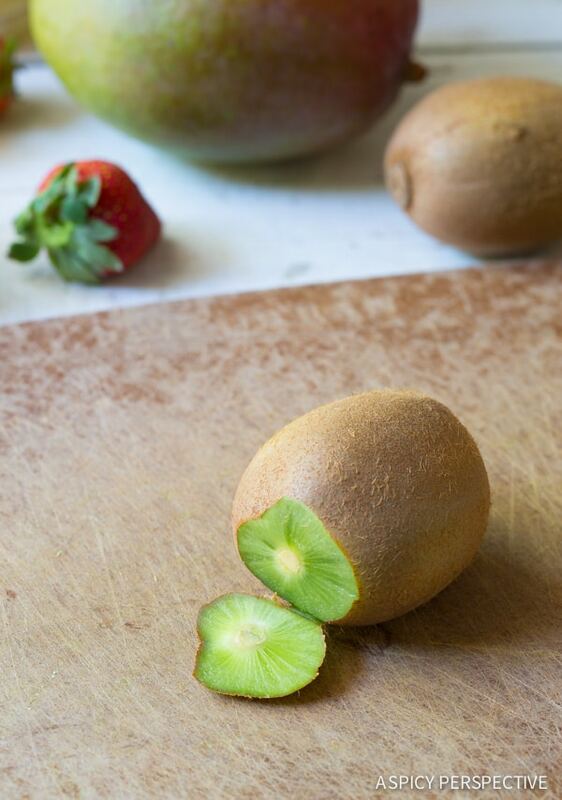 Place the kiwis on a paper towel to absorb the extra juice. Dice all the fruit and place in a large bowl. Add the chopped mint. Slit the vanilla bean down the center, lengthwise. Use the edge of the knife to scrape the vanilla bean seeds out of the pod. Then add the seed paste to the fruit salad and toss well to coat. Add the sugar if needed and toss again. FYI: Kiwifruit has a greater allergy potential than many fruits. Most people know if they are allergic to it and keep their distance. Just be careful when serving to children that have a heightened sensitivity to foods. 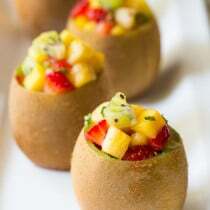 Sommer, these tropical kiwi cups look very cute! beautiful presentation! Love, love the kiwi cups!! 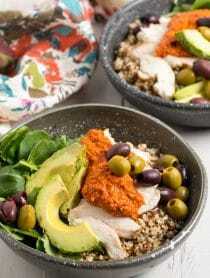 This salad is pretty much perfection, as well. I’m excited for the fruit salad, but what an adorable presentation! I love this, perfect for summer and so cute!! Oh my goodness my boys would LOVE these! These are the cutest little cups I’ve seen in a long time. Absolutely love them! 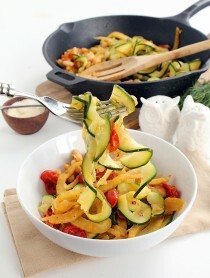 The presentation here is fabulous!!! Such a fun & fruity idea for entertaining! These are ridiculously cute! 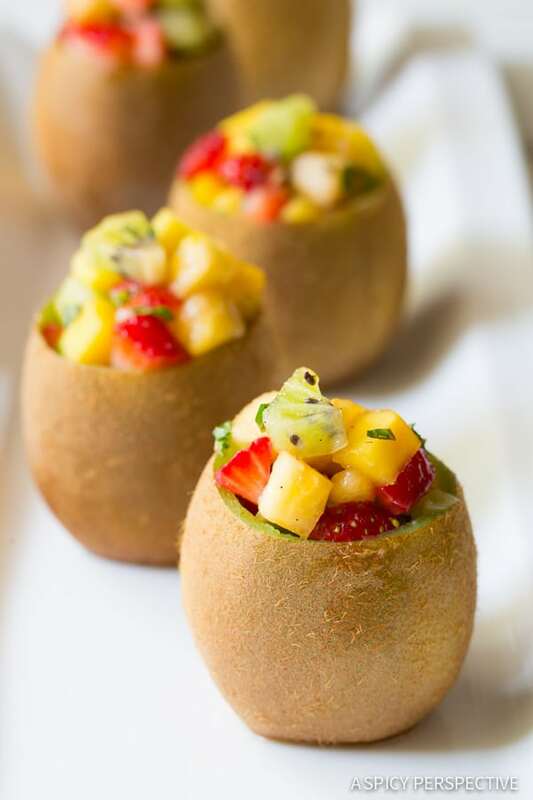 My kids eat kiwi fruit like it’s going out of style, and they would be so thrilled if I made these little cups for them. How clever! Cutest fruit cup ever! These are SO cute!!! I am so bummed I am anaphylactic to kiwi, but I still remember how delicious they are! How cute are these!! I’m a fruitaholic, so these are right up my alley!